Get set for an amazing excitement filled day, which will push you to your limits, and test your skills and endurance to the maximum. Your team will tackle the Derbyshire Dales - head on! 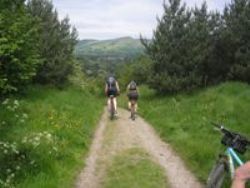 Set in the stunning Derbyshire Dales and the beautiful Peak District National Park this event offers a test for all challengers - experienced or novice. 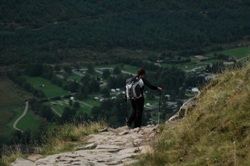 This one day will leave you feeling exhilarated and re-motivated - ready for the next challenge, whether it's at work or on your next outdoor adventure. After our event brief in Matlock you will take to the sweeping roads of the Peak District, passing Carsington Water bound for the village of Thorpe and the start of the Dovedale valley (where you will have lunch). Following the river Dove you then depart by foot following this ancient watercourse past limestone features a plenty. On completion of this trek its back in the saddle for pedal over and across the beautiful Derbyshire Dales countryside and back towards Matlock and your final challenge - just a small matter of an Abseil!! Once you've all successfully abseiled your way from the top of the famous outcrop its a short ride back to Matlock. Congratulations, you've now made it back to finish...phew! 09:00 - Meet at Matlock - event brief. 16:55 - Complete Abseil and cycle back to Matlock - Phew! Not Included but can be provided upon request for a small additional fee. Mountain Leaders, First Aiders, Bike Mechanics, Safety Equipment, Emergency Event Support Vehicle(s). All meals, cycle hire, transport to and from the event.